Built in Alexandria, a recent city at the time of its construction, the lighthouse of Alexandria has an aura that goes well beyond Egypt. It must be said that between its listing of the 7 wonders of the world and the archaeological excavations that took place at sea recently, there is enough to write about this monument of Antiquity. And that's where the lighthouse begins. Let us go back a little before, in 331 BC. It was in that year that Alexander the Great founded a city that bears his name. He had conquered an Empire on horseback over the West and the East, and undoubtedly wanted to mark his power. 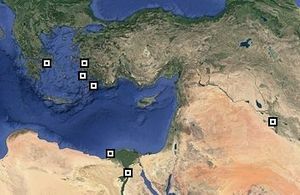 The new city of Alexandria is now Egypt, along the coast, north of a protective lake and facing an island connected to the mainland by an artificial pontoon. At the death of Alexander his empire was divided between his generals, the provinces were then administered by satraps, what we would now call "governors." The satrap of Egypt, a certain Ptolemy, took possession of the province and founded a new dynasty, the Ptolemaic dynasty, which reigned over Egypt a few decades. He then launched at Alexandria the construction of an imposing lighthouse, at the same time emblem of the kingdom and tools of navigation, the aim of which was both to guide the sailors in the dangerous waters of the coast and to impress travelers. In 297 the work began, it was under Ptolemy I Ster, the name that history has attributed to him. The work was very rapid, lasted only 15 years and ended in 283 BC, during the reign of his son Ptolemy II. Between 45 and 35 BC the lighthouse was repaired, it had been seriously damaged during a war between the Emperor Caesar and the partisans of Pompey. We were under the orders of Cleopatra. Then comes the time of degradation. The first millennium teaches us very little about the use of the lighthouse. Some witnesses report that it was operating normally, in spite of the time that passes. In 796 a violent earthquake caused the top of the lighthouse to collapse, the whole cylindrical part. It will never be rebuilt. A seat later Egypt was colonized by the Arabs who imported into Egypt the Muslim religion. between 873 and 783 the sultan of Egypt had a mosque built at the top of the lighthouse, giving it the title of the highest mosque in the world. This mosque was covered by a dome as is often seen in the representations of such buildings. In 956 the upper part of the lighthouse fell as a result of violent earthquakes which seriously shook Alexandria. In 1261 much of the lighthouse collapsed, always following seismic shocks. It was largely ruined and could no longer be repaired, especially since the façade itself fell in 1323 (Other dates indicate that the main earthquake took place in 1303). Finally a new earthquake definitively drops the last sections still standing in 1375.